Plastic Easter Eggs are inexpensive and after Easter, they become useless and usually end up in the trash. 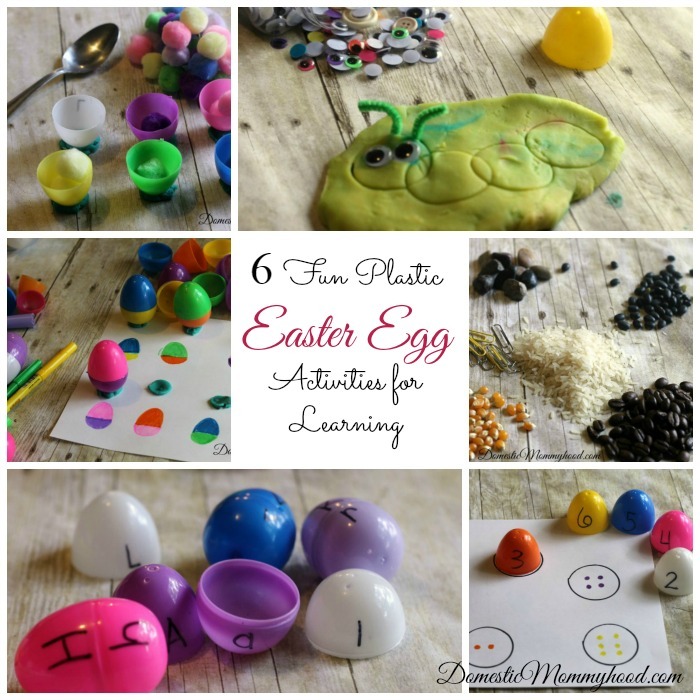 There are so many fun Easter Egg Activities you can do with your child all year long. Keep a gallon zip lock bag on hand to use for these educational and just plain fun kids activities. They all require very little prep on your part but will keep little hands occupied and happy for hours! 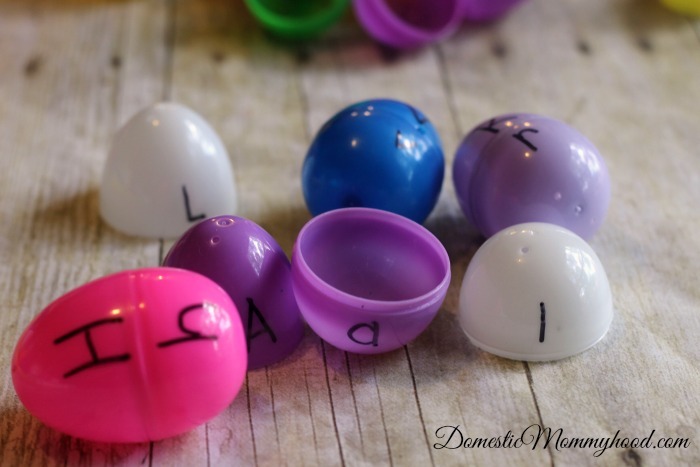 I am showing you 6 of our favorite Easter Egg Activities and have listed a few bonus ideas at the end for you to try. Alphabet Match– Super easy, educational, and fun for kids. 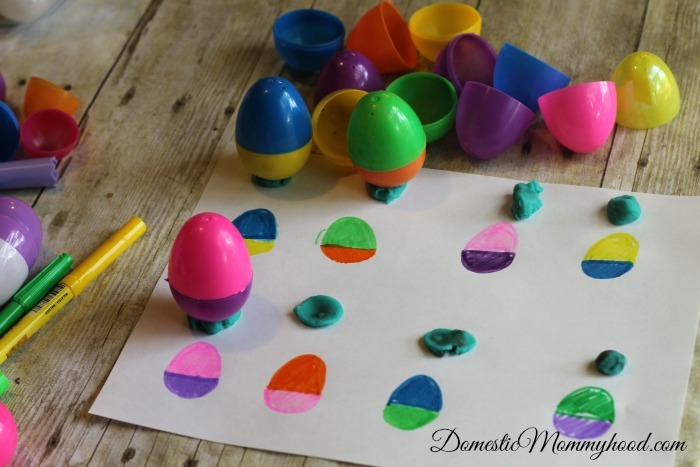 This activity also builds up fine motor skills as your child put together and pull apart the eggs. Write a capital letter one-half of the egg and the lower case on the other. Pull them apart and let your child match them up. If you are just beginning to practice letters stick with no more than 5 so that they don’t become frustrated. 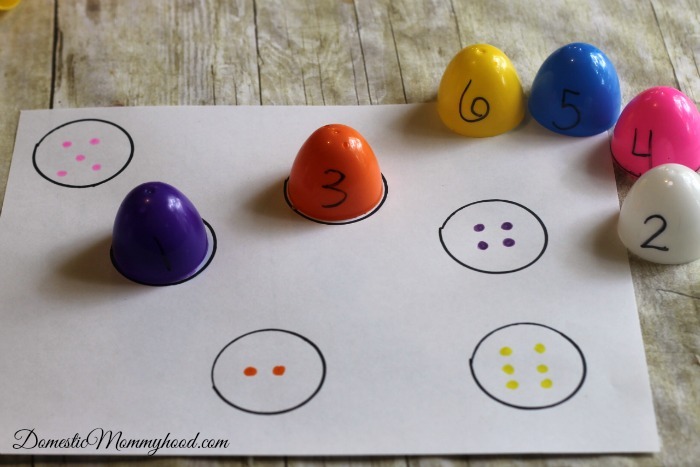 Patterning– This activity literally takes about 3 minutes to prep (please refrain from making fun of my egg drawings). Draw different color combinations of eggs on a sheet of paper, break apart eggs and have your child make matches. A great way to practice colors, fine motor skills, and patterning. To hold them in place I just put down a piece of playdough above each one. Sound Shake– Another fun activity that you can do with whatever you have on hand. 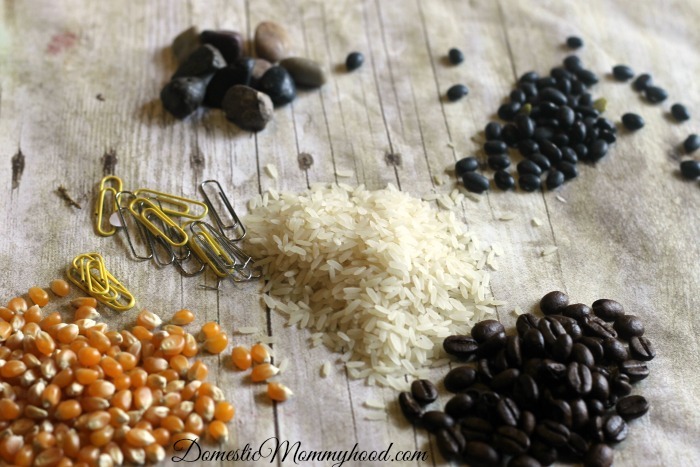 Gather small objects like beans, paper clips, corn kernels, pebbles, rice, pasta, beads, etc. Place roughly a tablespoon of an item in an egg, tape shut. Have your child shake eggs and try to determine what is in each- I also placed the items I used on the table to narrow down their choices so it wasn’t too difficult. Number each egg and write it down for yourself just in case you forget! Another fun idea is to fill 2 eggs with the same item and have your child match the sounds. This teaches your child to listen, and use problem-solving skills to discern what’s inside, and an older child might be able to tell by smell (coffee beans ) or weight as well. 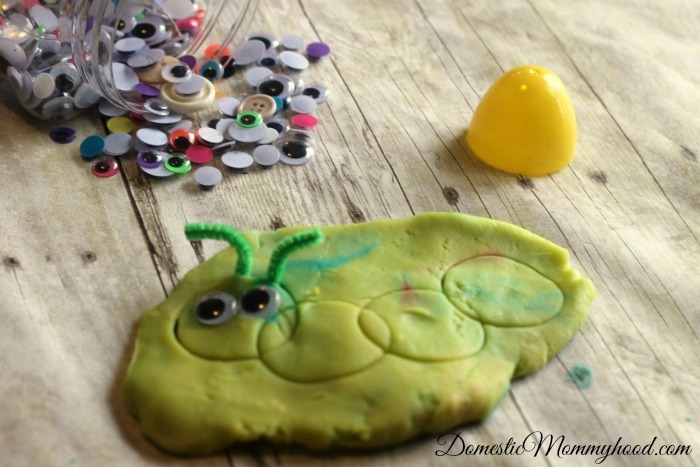 Stamping – Roll out play dough, stamp circles into it and use other craft items to create “pictures” like our circles here that became a fun caterpillar with a bit of chenille stem and some google eyes. Make 2 circles and “draw” a vehicle around it with a craft stick. Stack 3 circles on top of each other and create a snowman. Encourage creativity and thinking outside the box, errr egg. Number Match– Trace circles on a simple piece of paper, add colored dots 1-5, 1-10, or 1-20 whatever your child’s skill level is. Write the numbers on half an egg shell, encourage your child to match the number to the dots that represent it. They will have so much fun they won’t even know they are learning. Color Sorting– Remember the playdough blobs from the pattern activity? 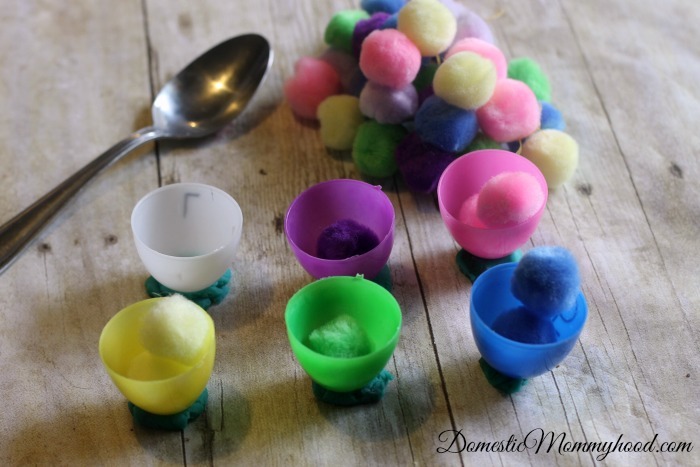 Use them again, this time to set ½ an egg upright, choose pompoms of matching colors, pile them up high next to your cups. Give your child a spoon or tongs and have them transfer the correct pom-pom to the correct egg. Build fine motor skills and color recognition with this one. Dip eggs half or whole egg into the paint and create a work of art. Use eggs as an art project base- turn orange into a carrot with a bit of green pipe cleaner, a pink one can be easily turned into a cute piggie with a few supplies. Place small toys or items in eggs any time of year and hide them around the house for rainy day fun. Use them in sensory bins for scooping, pouring, filling, and dumping. Looking for more Learning Activities?